Off late, Kajol has been wowing us with her sartorial choices. On a promotional spree for her upcoming film Helicopter Eela, Kajol has been wearing some really stylish clothes and carrying off many trends like the boss lady that she is. From florals to stripes to mixing a lehenga with a shirt, Kajol has been making some bold statements. Wearing prints and experimenting with some is also something that Kajol has aced during the film’s promotions, as we saw just yesterday. 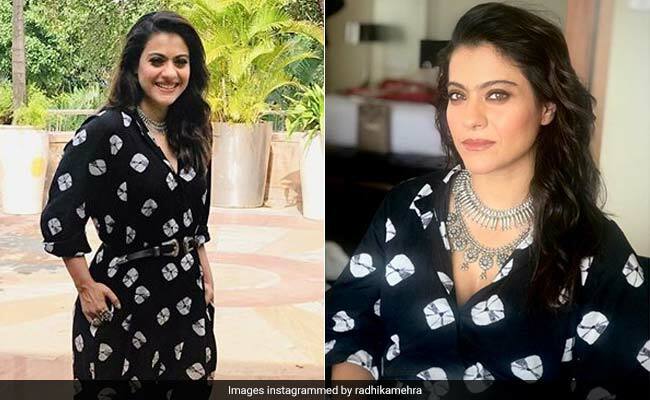 In a black dress with printed square motifs all over by Bungalow Eight, Kajol looked nothing less than a chic streetstyler. What made the outfit even better were the two statement silver necklaces she wore by Silver Streak and Inaayat Jewels. Talk about nailing two trends with one outfit – prints and fusion. This is not the first time Kajol has mixed two fashion trends together. She recently paired a Tarun Tahiliani lehenga skirt with a monochrome silk shirt and had us gawking at the rad style statement. To add more to the floral meets fusion look, Kajol sported statement choker and chunky embellished bangles with the outfit. On another occasion, yet another promotional event, Kajol mixed a printed skirt with a printed shirt and gave us a lesson in how to mix prints like a pro. The skirt, with its bold colourful stripes was from Label Anushree, whereas the shirt was hand printed. Of course, there were statement jewellery to complete the outfit. Looking forward to more such statement looks from Kajol. the Ailey Spirit Gala – choose your favorite from these 10 looks!